Quality time with grandma and grandpa is so important for growing kids, and it’s good for grandparents too. Just hanging out at home is special enough, but there are ways to make family time even more memorable. Here are some of our favorite activities for grandparents and grandchildren to partake in together, both outside and inside the house. Gather fun paper, stickers, stencils, glitter pens – whatever you’ve got on hand. Then, gather up the family photos and let your creativity soar. This is a fun way to relive memories together. You could start by looking through groups of photos and, together, picking out your favorite ones to include in the scrap book. You can then decide to work on pages together or separately. This is a fun activity you can keep forever. Spend the day at the zoo! It’s always a good time and there are so many different animals to see. This is a great idea if you’re wanting to get some activity in, as there is a lot of walking involved in a day at the zoo. Cooking with kids is great for development and building kitchen skills. Older kids and teens benefit from the baking experience as well. Plus, it’s so much fun to make seasonal treats. Make leaf-shaped cookies decorated with glitter and green frosting in the fall or throw together cookies designed after beach balls in the summer. Go to the store together to add to the fun, using your creativity to pick the theme and goodies used to decorate your baked goods. I still remember helping my Grandma tend to her garden, it’s an activity kids enjoy and learn from, and not to mention, remember for their entire lives. To make the activity even more special, dedicate a special corner of an existing garden to the grandchildren. Go together to pick out the plants that will go there and then work together to plant them and care for them over time. You can never go wrong with reading. Spend a quiet afternoon tucked on the couch, indulging in good books together. Read the same book, or quietly read your own books. No matter how old or young grandkids are, there’s a way to make reading relevant to everyone. 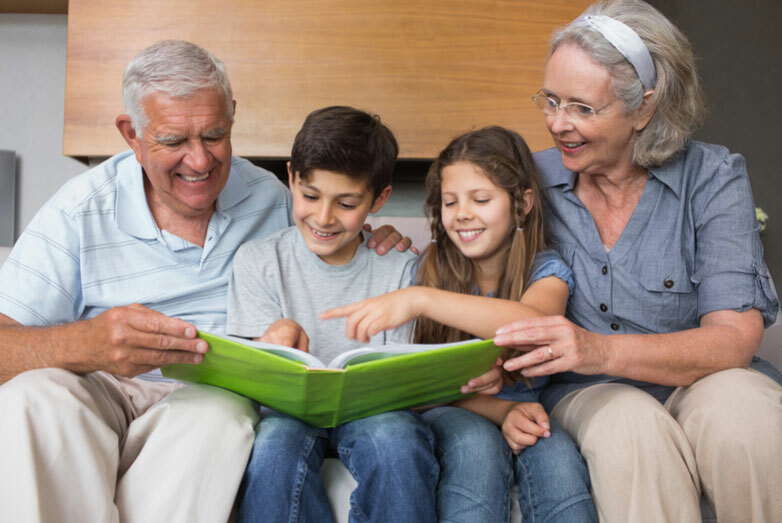 Grandparents can read to their grandchildren, or alongside them. There are so many hobbies to teach kids, from yoyo to pogo sticks, find an activity you think your grandchildren will appreciate. Learning a new activity is great for kids in many ways, plus it’s always fun to teach kids new things that they can get excited about. Don’t have your own cool yoyo tricks to show off? You can always find videos on YouTube of people doing awesome and inspirational things that’ll make kids even more excited to learn the basics. The fun thing about this idea is that you can flip the roles and let the grandkids teach Grandma and/or Grandpa a new hobby too. Puzzles are fun and can be quite tricky! Bust out the hot cocoa, put on some music and get busy putting together a puzzle. Let the kids pick out the design of the puzzle or surprise them with one you know that they’ll enjoy. Select the size and difficulty of the puzzle in terms of how long you want to spend working on it. Some puzzles can be completed in an hour, while others take multiple long-winded sessions to complete. Need a ride to hang with your grandkids? We’ve got you covered! Contact us today for a quote.